Robots might be rumoured to take over the world in the future, but for now - in 2019 - the corporate travel landscape is about to get a whole lot more 'human'. The frenzy of articles published over the past few years about blockchain, virtual assistants, online booking tools, Artificial Intelligence, etc., would lead anyone to believe that corporate travel was about to rocket off into cyberspace. That the mere mention of the word 'human' in the same sentence as corporate travel would be tantamount to admitting you belong in the Dark Ages. The irony is that super-hyped technologies like Artificial Intelligence are actually helping businesses approach corporate travel in a more human way by introducing a layer of personalisation that has been absent from corporate travel for many years. That’s the most exciting trend that we at Flight Centre Travel Group’s Corporate Traveller believe will shape corporate travel in 2019: blended technology. Technology needs to be simple and implemented only when it enhances your business and enables business productivity. It’s important to select the right technology which blends seamlessly with human expertise so you eliminate human error and reduce abuse of your travel programme while allowing the human element to focus on more strategic travel management. That’s blended tech. A blended technology approach offers many benefits for travellers, travel bookers and decision-makers alike. Travellers benefit from the latest easy-to-use online booking tools that provide them with a choice of booking options that are more likely to be in policy, while travel bookers can approve any travel requests and have every single record and invoice in one streamlined system. For decision makers, an efficient tech solution can offer greater efficiencies, not only from the reduced cost of travel but also through productivity gains from employees spending more time on their jobs, and less time on booking travel. Another key area where blended tech is successful is through generating insights that TMCs and their corporate customers can use to manage travel strategically. Atmosphere Research Group President Henry H. Harteveldt recently explained that employees may need to know how much of their allotted travel budget they’ve spent. He said: "Managers should have access to reports about their employees' compliance, spending, and other useful insights they can use to better plan and manage their departments' T&E budgets." Harteveldt predicts that blended tech will become more mobile-centric in the next 12 to 24 months. Websites aren’t going away, but as smartphones and other mobile devices become more affordable, useful, and prevalent, these will become the first 'place' where employees look to plan, book or manage a trip, and manage their expenses. Many of the augmented reality and virtual reality tools that are being introduced by a growing number of travel industry providers, including airports, airlines, and hotels, will also be mobile-based or introduced first through mobile platforms. According to Harteveldt, we'll also see greater adoption of smartwatches during 2019 and 2020 as these become more affordable and more apps are designed to work with these devices. Meanwhile, travel managers can expect to be introduced to the growing mix of "hearable" devices, such as in-ear devices that can link to a mobile phone for instant translation, and wearable devices, such as an updated version of smart-glasses. Although these innovations are exciting, it is important to remember that a successful blended technology strategy always needs to start with the company’s business, employees, culture and size. We need to remember that not every organisation, not every employee and not every traveller is tech-focused and that a human consultant can still offer very-much needed support, reassurance and expertise. "Today, there are roughly 124 different roles available across food & beverage, housekeeping, front office and chef departments. This industry is possibly the most diverse environment to cater to varied personality types, and this won't change much in the future." Professional travel consultants are not only familiar with ticketing the most complex routes, but they also know a few tricks of the trade that will help any company get the most out of their airfares. A professional consultant can tell you, for example, how far in advance to book your airfare to get the best deal. In 2016, the average client booking through Corporate Traveller saved 28.4% on the cost of a domestic flight when booking 22–30 days in advance, compared with clients who booked just three to seven days before travel. Saving tips and tricks are just the top of the iceberg when it comes to what a professional 'human' consultant can offer. Humans are still essential when it comes to training and quality control, but most of all when it comes to dealing with other humans. We all want to talk to a 'live person' when we are dealing with a crisis and when we need to be the exception to the rule. Success in a blended tech world comes from ensuring that technology enhances human efforts to create a seamless travel experience, no matter what platforms are involved. Tools like virtual assistants, online booking tools, etc., make the lives of travel buyers, travel bookers and travellers easier and provide a more tailored approach to corporate travel so the individual preferences of travellers are met as far as possible. Not content to be just another number and run the gauntlet of traveller friction, today’s business traveller wants their travel experience to be painless and pleasant. They want the same level of convenience they enjoy in their personal lives to extend to business life. For companies that also means learning how to balance the use of technology with the expertise of a human to understand how your staff are travelling, to inform strategically how they can travel better and make the changes you need to make to achieve a greater ROI on your corporate travel. 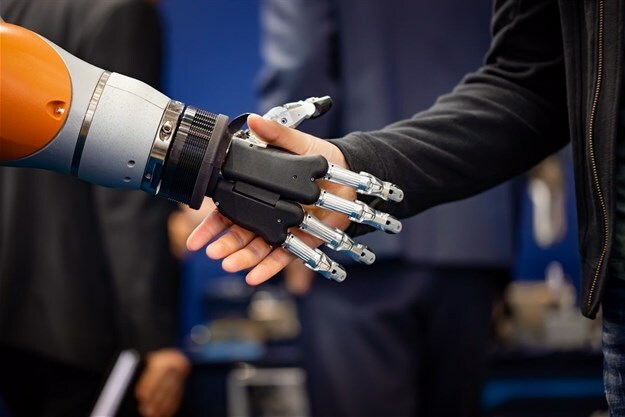 There are parts of the process technology can help you achieve these goals, but you certainly need the human touch to follow the journey to its end. You don’t need to be big business to reap the rewards of a blended tech approach done well. With a proven track record in business management and finance, Oz Desai heads up Flight Centre Travel Group's dynamic Corporate Traveller brand in South Africa. Having worked in a retail travel, management and finance environment within the Flight Centre group, Desai's first-hand experience brings great depth to the role of positioning Corporate Traveller as the preferred provider of travel solutions to corporate South Africa.